​What Gifts are received at Confirmation? "Name the seven gifts of the Holy Spirit?" Would you be able to name them? Would you walk away a millionaire? If you’d be completely stumped or if you could only name a few, you’re not alone. Many of us have difficulty recalling what these seven gifts that we received when we were confirmed are — especially if we received the Sacrament of Confirmation many moons ago! It’s important for all Catholics to be reminded of these marvelous gifts bestowed upon us, and more importantly, to ponder how these gifts help us live a virtuous life — the life God intends us to live. What are the ​7 gifts of the Holy Spirit at Confirmation? ​The seven gifts of the Holy Spirit are: wisdom, understanding, counsel, fortitude, knowledge, piety, and fear of the Lord. As Catholics, we are given these gifts on the day we received the Sacrament of Confirmation. When the bishop lays his hands on the confirmandi (person being confirmed) he prays the following: "All powerful God, Father of our Lord Jesus Christ, by water and the Holy Spirit you freed your sons and daughters from sin and gave them new life. Send your Holy Spirit upon them to be their helper and guide. Give them the spirit of wisdom and understanding, the spirit of right judgment and courage, the spirit of knowledge and reverence. Fill them with the spirit of wonder and awe in your presence. We ask this through Christ our Lord. Amen." Then, the bishop makes the sign of the cross with holy chrism on the confirmandi’s forehead, and says, "Be sealed with the gift of the Holy Spirit." Let’s take a closer look at what each gift means and how we are to use them throughout our lives. 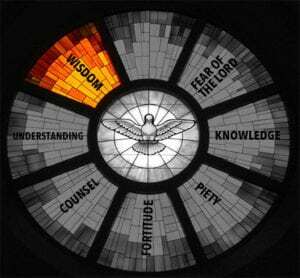 ​When we receive the gift of wisdom, we are given the ability to view the world through God’s perspective. Imagine that! With this gift we are able to see and evaluate all things — joy and sorrow, success and failure — through the eyes of God. Imagine walking through life with God’s wisdom helping us to make all of our decisions — big and small — and to see others as God sees them. ​St. Thomas said, "In this very life, when the eye of the spirit is purified by the gift of understanding, one can in a certain way see God." The gift of understanding grants us the ability to comprehend the Scriptures, the messages they hold, and the meaning of Christ’s teachings. In a way, this gift goes hand-in-hand with the gift of faith: the more we understand the teachings of the church, the more our faith is strengthened. ​The gift of counsel, also known as judgment, gives us the ability to judge what is good and evil and to act accordingly. It helps us to assess a situation promptly and correctly so that we are always living our life according to God’s will. Not only does counsel provide solutions to difficult and unexpected situations in our own lives, but it also helps us to give counsel to others. ​In our daily battle against temptation, sin, and anguish, we need the gift of fortitude to see us through. Fortitude is the mental and emotional strength given to us by the Holy Spirit to face adversity, danger, or temptation. Fortitude helps us to persevere throughout our time in this world so that we may reach our goal of being united with Christ in the afterlife. The lives of martyred saints are examples of fortitude in practice. Even in the face of persecution, fortitude helped them defend their faith. ​When we speak about the gift of knowledge, we aren’t talking about scientific or historical facts such as when World War I started and ended. Rather, we are speaking about spiritual knowledge. This gift helps us determine if we have all of our spiritual facts in order such as: are material objects and idols keeping us from putting God first? Are our sinful ways creating a road block between us and God? What is the state of our soul? Where do we need to make changes? ​This gift is one of the most confusing and often misunderstood. The word “fear” is what throws many people off. Are we supposed to be afraid of the Lord? Not at all! Our relationship with the Lord is based on love, not fear. What this gift means is that we should fear the horror of sin and how sin separates us from the Lord. We should fear living, speaking, or acting in any way that offends the Lord. St. Thomas Aquinas explained it best when he said “this gift is a "filial fear," like a child's fear of offending his father, rather than a "servile fear," that is, a fear of punishment. We should live in wonder and awe of God’s perfection and fear ever hurting Him. ​Are You Using Your Gifts? 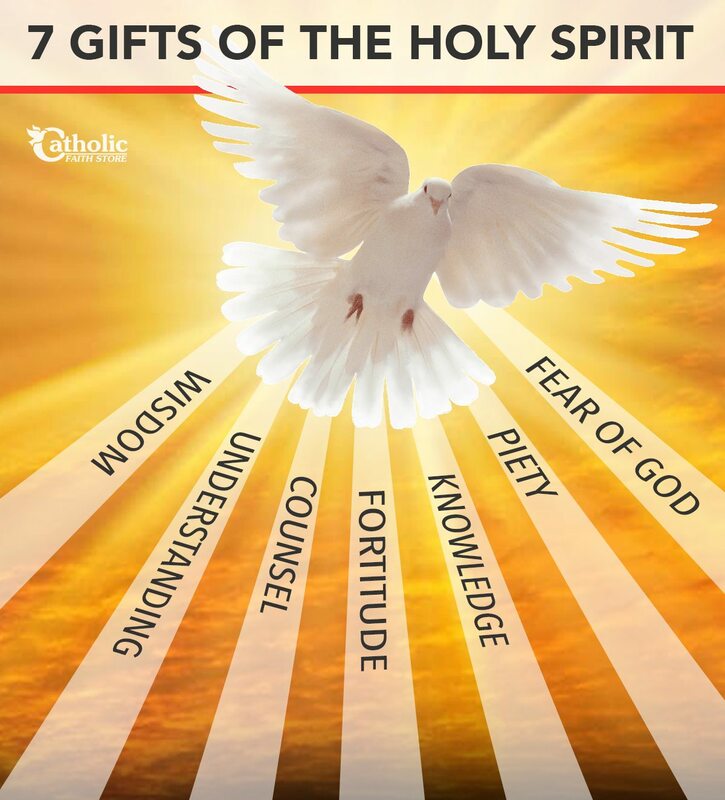 ​These seven gifts were given to us by the Holy Spirit the day we stood before the altar to be confirmed. Of all the gifts we received that day, these seven are the greatest of them all. Unlike material gifts, these gifts are meant to last a lifetime; they never go out of style, they never tarnish, break, or need to be replaced. It’s up to us to put them to good use, and not just box them up and put them on the proverbial shelf. 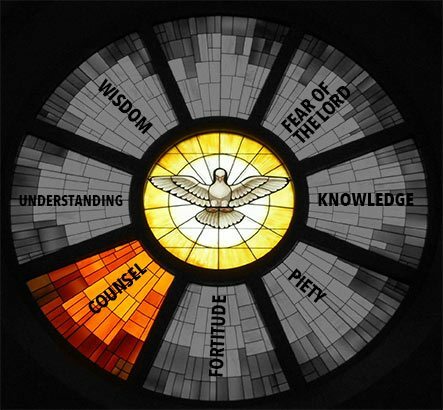 ​Ask yourself: How have you been using these gifts of the Holy Spirit? Are you using them to your fullest potential? How have these gifts strengthened your relationship with God? ​The Holy sacrament of Confirmation is such an important part of one's Catholic journey it is very rightly celebrated; both by the confirmandi and their sponsors. The very essence is the Holy Spirit, as the Bishop, or his appointee, lays his hands and anoints the head to pass on the strength imbued by the Holy Spirit. ​The dove has been adopted as the traditional symbol of the Holy Spirit as it represents innocence and purity. The confirmandi will traditionally receive physical gifts as well as those from the Holy Spirit. 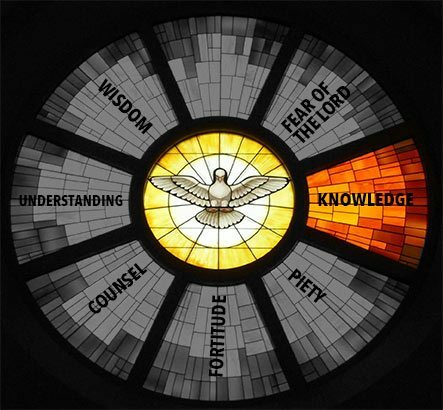 ​You'll see that the dove is at the center of ​all physical gift items representing Confirmation. ​On this sacrament the confirmandi ​will choose a patron saint to be devoted to for the rest of their lives, and ​they appreciate receiving ​a gift​ related to that chosen patron saint. These gifts include rosaries or pendants bearing the name of the Patron Saint along with asking them to pray for them. thank god for giving me this meaningful site…. I found this blog extremely helpful in my desire for love and peace and a close relationship to God. Thank You!